Somewhat unfairly my view of Ironman Switzerland is tainted by the conditions I raced it under – rain accompanied me through the swim and bike. The only time I have raced in a rain jacket. My performance there was OK: a respectable time, but short of my goal. No Kona slot on that occasion. 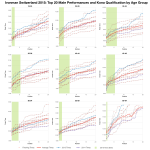 Like most of the other European Ironman races, Switzerland is fast and competition for slots is high. Conditions are not usually as damp as in 2008 either. Using Frankfurt by way of comparison we can see how closely Ironman Switzerland’s distribution of finisher splits lines up. 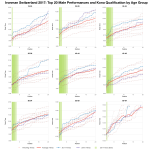 The curves are remarkably similar, although Switzerland’s lag slightly behind Frankfurt – it’s a fast race, but not quite on the same level as the European Championship. 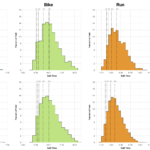 In particular on the bike we see a clear peak at the 5:15-5:45 period in Frankfurt and the 5:30-6:00 period in Switzerland. Median splits by division support this view. Again Frankfurt is the faster race, particularly on the bike. 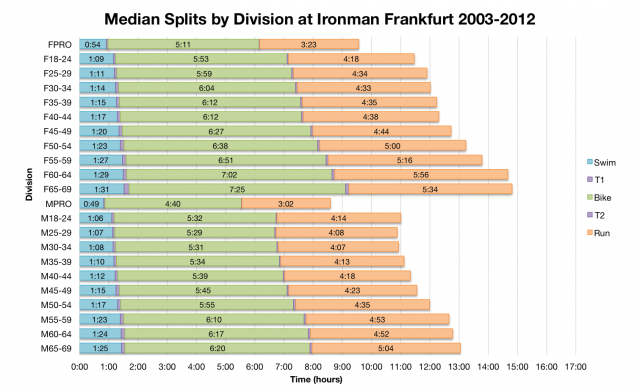 Switzerland’s times still make it a good choice for a fast race though – 9.7% of finishers have broken 10 hours there in the last 8 years ranking it 6th among Ironman races (Frankfurt is 4th at 12.6%). It’s reasonable to conclude that Switzerland is standard European Ironman racing. 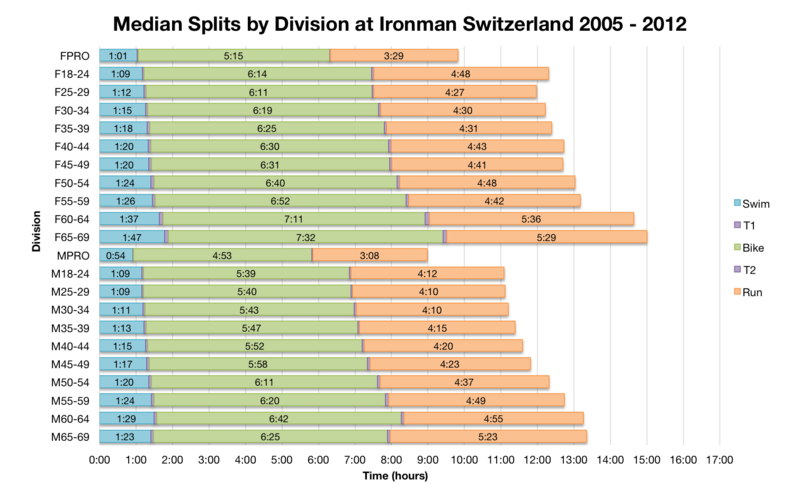 Had I noticed that the 2013 slot allocation was already available for Ironman Switzerland I wouldn’t have spent the time calculating my own. The algorithm I use is not a perfect match, but the differences between my estimates and the official allocation are the largest I’ve seen. My athlete numbers may be incorrect – the official figures allocate a slot to the women’s 70-74 category whereas I found no one listed in that category. 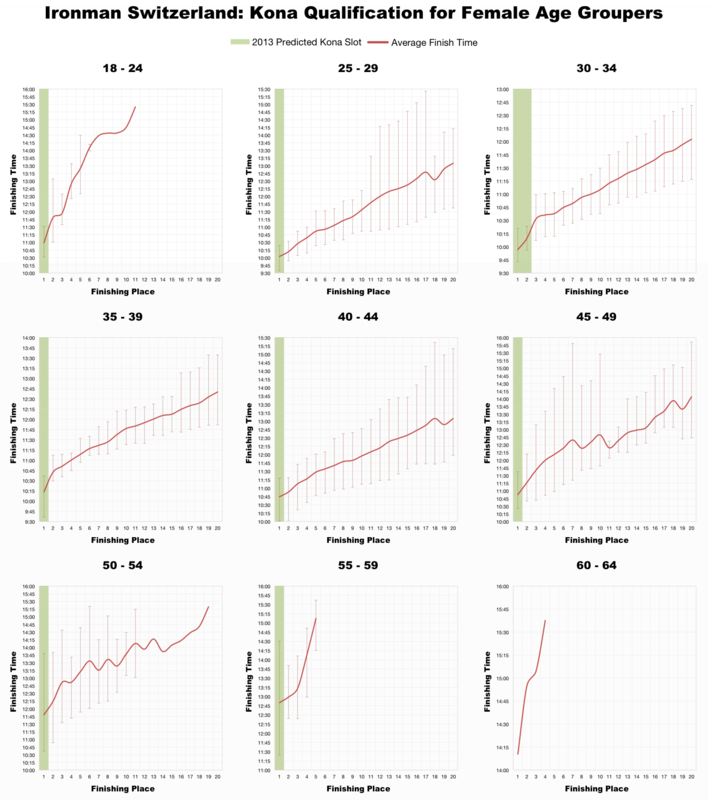 Presuming the official numbers to be more accurate I have used them for the following Kona qualification charts. As with the other European Ironman events regardless of the slots available qualifying times are fast and the gap between first and tenth place tends to be narrow. 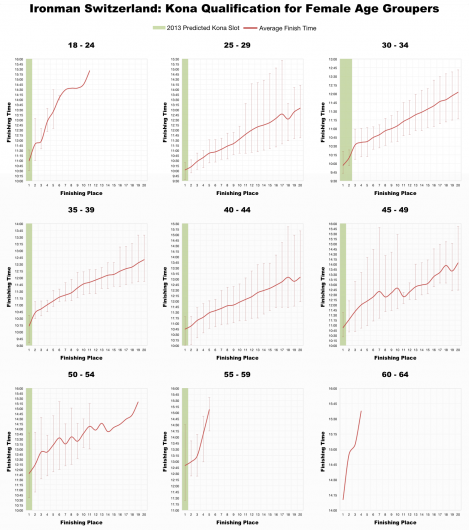 For the men 30-40 year olds need to be looking below 9:30 and 40-50 year olds probably 9:45 or under. 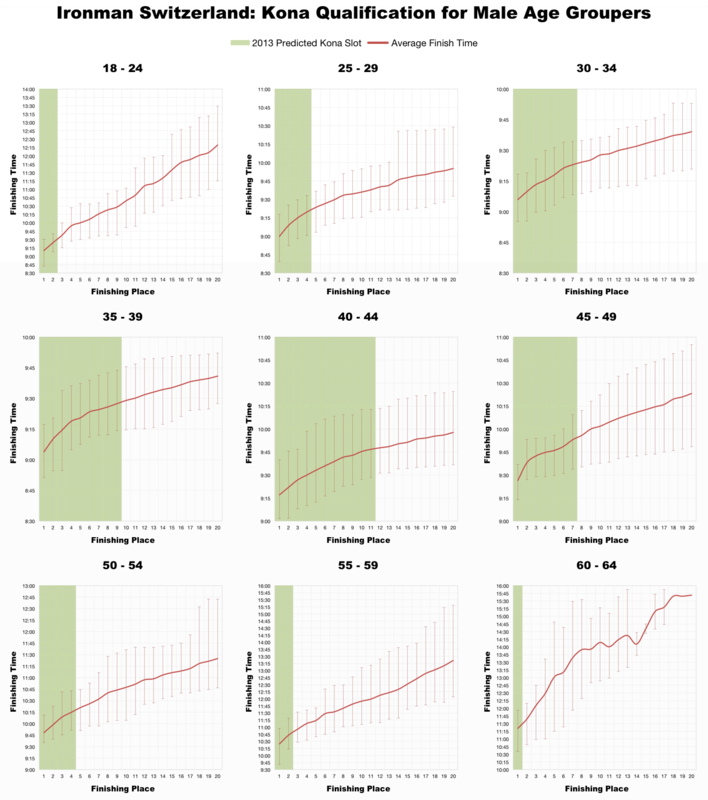 For the women, apart from winning your age group, 30-40 year olds need to be 10:15 or under and 40-50 year olds around the 10:45 mark. Men at the least should expect a good number of athletes to be capable of that. I’ve a couple of athletes racing in Zurich at the weekend so will be following the race online. Neither are focussed on a Kona slot at this event, but those who are should expect the competition to be steep.